Somalia: Is This the Right Time to Downsize Amisom? Amisom soldiers patrol a road at Ceeljaale, Somalia, on May 11, 2018. The African Union Mission in Somalia (AMISOM) should have completed its second phase of military force downsizing as part of its exit strategy by today, 28 February. 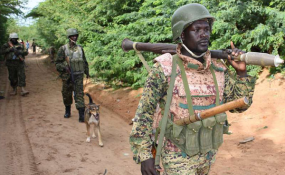 But serious ongoing security threats posed by al-Shabaab and other armed groups raise questions about the timing of the drawdown and the implications for Somalia's security. Burundi's opposition to troop numbers being reduced has also delayed this part of the exit strategy. This was possible only after al-Shabaab's hold on major population centres across southern and central Somalia was reduced. The country has made significant progress since 2012. At the least, government structures at federal and state levels have been established. The progressive reduction of military forces has been in the making for some years, but it's always been closely tied to the mission's unclear exit strategy. The AU-United Nations (UN) Joint Review of AMISOM in 2015 recommended a gradual and condition-based shift from military- to police-led security in Somalia. Both the AU Peace and Security Council (PSC) and the UN Security Council (UNSC) endorsed the recommendation. In the initial phase, all the military contingents reduced their forces by 4% to meet the first 1 000-soldiers drawdown. However the planned second drawdown was delayed. This was mainly because of Somalia's extremely volatile security situation and slow progress in the development of its security sector. The mission has been militarily heavy since it began, with soldiers still accounting for over 95% of the total force strength. The drawdown plan formed the crux of AMISOM's exit strategy, which sees full handover of security responsibilities to Somalia's government and planned exit by December 2021. This is preceded by a condition-based further drawdown of troops between 2019 and 2021. However the timing of AMISOM's drawdown raises concerns as al-Shabaab continues to launch deadly attacks on the mission and its local and international partners. Compared to the period between 2011 and 2015, major offensive campaigns against al-Shabaab have stalled in the past three years. Despite recent military campaigns, the group still controls about a fifth of Somalia's territory, mainly rural areas and small towns in the southern and central parts. Islamic State is also growing in Somalia. So in Somalia's unstable political and security environment, what should be done regarding AMISOM's exit from the country? And how can sustainable peace be achieved? A drawdown in Somalia must be accompanied by a political strategy that empowers AMISOM and its local partners. In line with various PSC decisions, AMISOM needs a more robust political mandate, and resources to expand its political engagements, mainly through supporting political dialogue among all local actors. This includes al-Shabaab. Prioritising political solutions in volatile environments like Somalia was affirmed by the 2015 High Level Independent Panel on Peace Operations report and the UN's Action for Peacekeeping. The onus is equally on Somali politicians to resolve the country's recurring political crisis. Somalia is yet to adopt the provisional constitution, which should settle some of the ongoing disagreements between the federal government and member states. It should help define federal-state powers and relations, and resource management and sharing. AMISOM should also prioritise capacity building in Somalia's security sector. This requires expanding the geographic presence of security structures, increasing their staff and enhancing their capacity. Somalia's 2018 transition plan deals not only with the military, but also covers stabilisation, local governance and state-building activities that include the expansion of local policing and justice. Somalia's recent gains could be derailed if the threat of al-Shabaab and other armed groups isn't conclusively dealt with, and the country's political impasse is not resolved. Too much focus on downsizing the military forces in the country without a lasting political solution will not deliver peace and security in Somalia.